28.9 by 65.3 cm., 11 ¼ by 25 ½ in. Tighnabruaich is a small village facing the island of Bute. It is in the Cowal Peninsula, 25 miles from Dunoon. 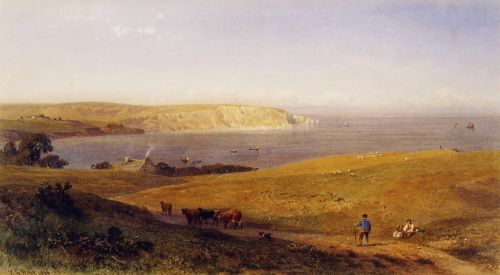 Hine was the son of a Brighton coachman and was self-taught, learning by copying the Copley Fielding watercolours belonging to the local vicar. He was apprenticed to Henry Meyer the London engraver but exhibited landscapes from 1830 until his death in 1895 mainly at the New Watercolour Society.